It is a play on shapes captured by AFP photographer Aris Messinis. This bench, at the Larissa stop of the metro, gives the impression that every seat is a man, until it finally comes to a Greek priest who is seated at the end. 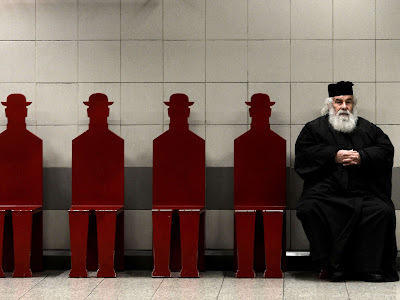 The bench is actually a piece of art created by John Gaitis (d. 1984), who created a series of works titled "Lonely Men" (Μοναχικά Ανθρωπάκια).